Washington, D.C. – December 12, 2016 – Reading Is Fundamental (RIF), the nation’s largest children’s literacy organization, has been selected as Macmillan Children's Publishing Group’s charity of choice for the 50th anniversary celebration of Bill Martin Jr and Eric Carle’s classic Brown Bear, Brown Bear, What Do You See? To join in the celebration, RIF and Macmillan invite book lovers to post a picture of themselves reading Brown Bear on Facebook, Twitter or Instagram using #BrownBearEverywhere. For each post during the week of December 10 – December 17, Macmillan will donate $1, up to $2,500, to RIF to help get books to kids who need them most. In honor of RIF and Brown Bear’s shared 50th Anniversary, Macmillan will also donate 5,050 copies of Brown Bear and 10,000 additional children’s book titles to RIF for distribution in local communities throughout 2017. “Macmillan is delighted to partner with Reading Is Fundamental,” said Angus Killick, VP, Associate Publisher at Macmillan Children’s Publishing Group, “and to contribute towards their incredible work during their 50th anniversary year. 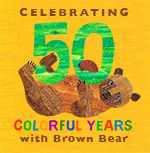 It is a wonderful stroke of serendipity that Brown Bear is also 50 years young! Here's to many more years working towards the common goal of improving children's literacy across the country." RIF and Macmillan’s partnership will continue throughout 2017 in celebration of 50 colorful years with Brown Bear! Reading Is Fundamental (RIF) is committed to a literate America by inspiring a passion for reading among all children, providing quality content to create impact, and engaging communities in the solution to give every child the fundamentals for success. As the nation’s largest children’s literacy organization, RIF has provided more than 412 million books to 40 million RIF kids over 50 years, inspiring generations to read, learn and grow. Sign up for our newsletter at www.rif.org and follow us on Twitter to learn more. Macmillan Children’s Publishing Group comprises Farrar Straus Giroux Books for Young Readers, Feiwel and Friends, First Second, Henry Holt Books for Young Readers, Imprint, Priddy Books, Roaring Brook Press, Square Fish, and Swoon Reads. These imprints are home to award-winning, New York Times bestselling authors including Madeleine L’Engle, Natalie Babbitt, Roald Dahl, Jack Gantos, Nancy Tillman, Catherynne M. Valente, Marissa Meyer, Paul Pope, Gene Luen Yang, Eric Carle, Leigh Bardugo, Lane Smith, Nick Bruel, Erin E. Stead, Philip C. Stead, and hundreds more popular authors and illustrators. Macmillan Children’s Publishing Group is proud to publish many of the classics of children's literature including A Wrinkle in Time, Tuck Everlasting, The Black Cauldron, A Cricket in Times Square, Brown Bear, Brown Bear, What Do You See?, and The BFG, as well as popular new classics Speak, A Sick Day for Amos McGee, Dead End in Norvelt, On the Night You Were Born, and Bad Kitty.